David Macaulay is renowned for his intricate drawings demystifying everything from how castles were built (Castle, 1977) to the inner workings of the brain (The Amazing Brain, 1984). But he may be best known for the comprehensive The Way Things Work, first published in 1988. A 1991 Caldecott Medal winner and 2006 MacArthur Fellow, the British-born illustrator, 71, has lived in Norwich for the past dozen years. Now on view at the Vermont Arts Council‘s Spotlight Gallery, “Macaulay in Montpelier: Selected Drawings and Sketches” provides insight into the artist’s meticulous work translating a variety of technologies and structures into visual form. In addition, Macaulay presents the lecture “Illustrating Architecture From the Inside Out” on Wednesday, October 24, at the University of Vermont in Burlington. Seven Days chatted with Macaulay about his process and perfectionism and what he’d like to do next. “In all my books, I use colour to tell the story, highlight the most important aspect and heighten the drama,” he explains. His readers may be under five, but Haughton believes the secret of his success is that he makes them page turners. “When planning my books, what I love thinking about is the before and after page turn. There has to be that anticipation and drama as you turn the page. With Shh! We Have a Plan, they are lining up to catch the bird and are poised with the net and looks like they are going to catch him this time, and you turn the page and you see the bird is flying off as they miss again,” he laughs. 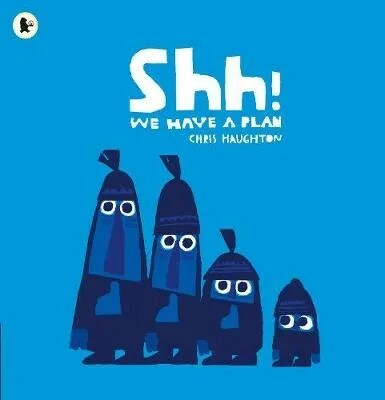 An entertaining tale of three hapless hunters being bamboozled by birds, this funny, engaging and poignant tale won the Assocation of Illustrators award for best Children’s Book in 2014 and has been translated to the stage by Northern Ireland children’s theatre company Cahoots NI. Maybe I should say, the whips of my publishers! It sounds quite cheesy, but it is the popularity of the books and the affection I get from children and parents. I often think I should retire and do something else; paint or something. I feel I have done enough books for the children of this world to read — even babies have a lot to read these days. But I will carry on a few more years. I guess it’s not my decision. Probably creating The Gruffalo with Julia Donaldson. That’s the most successful book. I wouldn’t consider it the best thing I’ve ever done, but it’s the greatest achievement. via Judith Kerr: ‘I’m still surprised at the success of The Tiger Who Came to Tea’ | Books | The Guardian. The Puffin blog spoke to Lauren O’Hara, illustrator of the beautifully-dark fairy tale Hortense and the Shadow, about her influences and illustrators that have inspired her work. When I was very little, I spent hours reading a copy of the fairy tale The Snow Queen with my sister. It was illustrated by Errol le Cain, and the pictures looked so magical we half thought they actually might be. Maybe one day we’d fall into an illustration, and ride under the Northern Lights on a talking reindeer. I still get that tingly feeling when I see Errol Le Cain’s paintings – he’s enchanting. Nicoletta Ceccoli is a pop surrealist painter/illustrator from the Republic of San Marino (a microstate within north-central Italy). Nicoletta has an animation degree from the State Institute of Art in Urbino and has illustrated over 30 children’s books since 1995. She does both commercial and personal work, and has exhibited her artwork all over the world. Among many other awards, she has received a silver medal from the Society of Illustrators in New York and the Andersen Prize, “honoring her as the best children’s book illustrator in Italy.”Ceccoli’s work depicts a world of delicate, feminine girls alongside freaky creatures in strange situations. via The “best children’s book illustrator in Italy” is coming to Los Angeles with a new painting exhibition / Boing Boing. Czech artist Karel Franta, the author of illustrations of books for children and winner of a number of international awards, died at the age of 89 on Wednesday. Franta illustrated more than 100 books for children, mainly by Czech authors, and also the production of foreign, particularly German-language publishers. via Children’s Book Illustrator Karel Franta Dies At The Age Of 89. VISA staff in Britain have “lost sight” of what immigration rules are intended to achieve, according to a senior Scottish MP, who has described the refusal of a visa for an acclaimed Iranian illustrator of children’s books as “a nonsense”. Stuart McDonald, the SNP’s front-bench spokesperson on immigration, was speaking after the campaigning group Scottish PEN condemned the Home Office’s refusal to grant a visa to Ehsan Abdollahi to attend the Edinburgh International Book Festival. via UK visa staff have ‘lost sight’ of purpose as Iranian illustrator refused entry to Edinburgh book festival (From The National).